A couple dozen Arizona craft breweries will bring their beers to Phoenix in September to vie for a professional judge’s choice award and a people's choice award. Here's why this particular beer competition is big news: The competing brewers are making their beers with purified recycled wastewater for the 32nd Annual WaterReuse Symposium being held in Phoenix. The competition is the culmination of a statewide traveling campaign called the Arizona Pure Water Brew Challenge created by a Pima County Southwest Water Campus partnership. The campaign's goal is to help people understand and trust the technology that creates purified recycled water, a renewable source of future drinking water. Recycling wastewater is nothing new. AMWUA member cities put virtually all of their wastewater to beneficial use. Since 1973, much of the recycled water has been sent to cool the Palo Verde Nuclear Generating Station, a power station southwest of Phoenix that provides energy for 4 million people in four states. Cities use recycled water to create fishing lakes, restore or construct riparian areas, and irrigate large turf areas, such as parks and HOA common areas. Cities also store recycled water underground for future use. The Arizona Department of Environment Quality sets the standards for recycled water and cities treat recycled wastewater to A+ quality, which means it is treated and disinfected until there are no detectable disease-causing bacteria. There is now technology to clean A+ wastewater beyond drinking water standards. This water is called purified water. It is recycled water that is further treated using ultra filtration, reverse osmosis, ultraviolet disinfection with advanced oxidation, activated carbon filtration and chlorine disinfection. Professionals view purified water as an important part of solving drinking water shortages in the future, but it has one major problem standing in its way: public perception. Imagining where the water originated is a hurdle many people find difficult to overcome. The Arizona Pure Water Brew Challenge was designed to help people get over that hurdle. The project was created by a partnership that includes Pima County Southwest Water Campus, a team of water professionals, University of Arizona scientists, local municipalities, including Tucson Water and the Town of Marana, and consulting organizations. In November 2016, the concept won the $250,000 New Arizona Prize competition and its $2,500 people’s choice award. The project received an additional $50,000 in assistance from the WaterNow Alliance and about $50,000 in donated time and equipment. Team members who created the Arizona Pure Water Brew Challenge knew it wasn’t enough to simply tell people purified water was safe and tasted good, they had to show people. The idea of a beer contest was appealing but the Arizona team was looking for something more ambitious, something that would reach a wider audience and showcase the technology that produces purified water. The partnership decided to build the technology used to process purified water inside a semi-trailer truck. The truck has traveled around the state and used local water professionals to explain to visitors how the technology works. The truck includes looping videos explaining the basics of Arizona water, such as where drinking water comes from and how it’s treated. The truck travels to festivals and events, such as the Arizona Great Outdoor Festival in Flagstaff. People who visit the truck are asked to fill out a 15-question survey about their perception of purified recycled wastewater. So far, the majority of the 1,300 surveys completed show people are open to the idea of drinking purified water – but are more enthusiastic about drinking beer made from purified water. 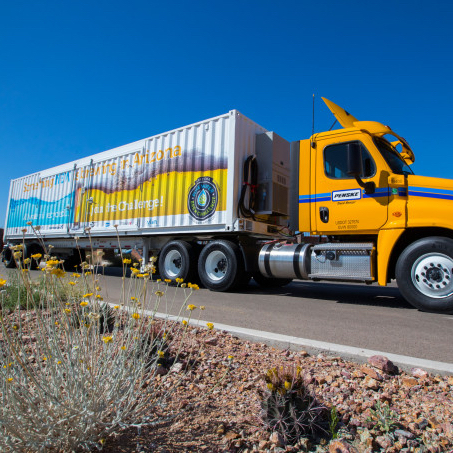 The Arizona Pure Water Brew Challenge project included recruiting small and large independent craft breweries to compete in a taste challenge using beers brewed with purified water processed in the truck. The team has worked closely with the Arizona Craft Brewer’s Guild and participating breweries come from across the state, including the cities of Yuma, Sedona, Flagstaff, Oak Creek, Tucson and Phoenix. In July, the truck received its permit to create purified water from the Arizona Department of Environmental Quality and was hooking up to a wastewater treatment plant and purifying water for participating brewers. The team also was filling a tank with purified water to take to a bottling company to have samples ready to hand out to visitors at the campaign's next stops and at the week-long WaterReuse Symposium. It’s not really about the beer created from this campaign. It’s about introducing Arizona residents to the technology that can help augment future water supplies. Once the craft brew challenge is completed the team will have just enough money left to take the truck to a half-dozen more festivals through December. The team is looking for funding to keep the Arizona Pure Water Brew Challenge campaign on the road in 2018.